When will be Cupcake Cage Match next episode air date? Is Cupcake Cage Match renewed or cancelled? Where to countdown Cupcake Cage Match air dates? Is Cupcake Cage Match worth watching? In Cupcake Cage Match, champion bakers proved they could make the world's most delicious cupcakes. They even took on a thousand cupcakes ... but they never faced anything like Cupcake Cage Match. Two all-time Cupcake Wars Champions will face off in a one-on-one winner-take-all baking battle so intense we had to put it in a cage. Only one will walk out with a $5,000 prize, but to win in the cage, they've got to win the audience's vote. Host Jonathan Bennett and commentator Angel Moore keep us up to speed on the action. Host Jonathan Bennett and commentator Angel Moore take us along on a one-on-one baking fight to the finish. Two cupcake legends enter the cage and battle to create a single cupcake with 10 different flavors, and then serve up some buried treasure -- three cupcakes baked inside of a single giant cupcake! Only the strong will survive this cage match. 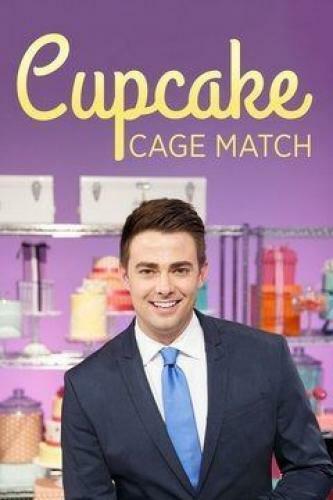 Host Jonathan Bennett and commentator Angel Moore take us along on a single round, one-on-one baking fight to the finish, where two cupcake legends will enter the cage and fight to create five different All-American diner foods -- in cupcake form. With $5,000 and the cage match belt at stake, two will enter, but only one can leave victorious. Cupcake Cage Match next episode air date provides TVMaze for you. EpisoDate.com is your TV show guide to Countdown Cupcake Cage Match Episode Air Dates and to stay in touch with Cupcake Cage Match next episode Air Date and your others favorite TV Shows. Add the shows you like to a "Watchlist" and let the site take it from there.